Fairy tales are important. I recognize that, and understand it, particularly as snapshots of cultural ideas and, similarly to Mythology, a kind of "what the people we came from were like" manner. But, I don't love them. Much like Arthurian Legend, there's just something about the idea of them that kind of turns me off. I fully acknowledge this as a defect of my character -- as someone who loves and studies mythology, I really SHOULD love Fairy Tales, too, precisely because there are ways in which Fairy Tales intersect with myth, legend, and Saga, and if I don't read and enjoy them, these are connections I'll miss. 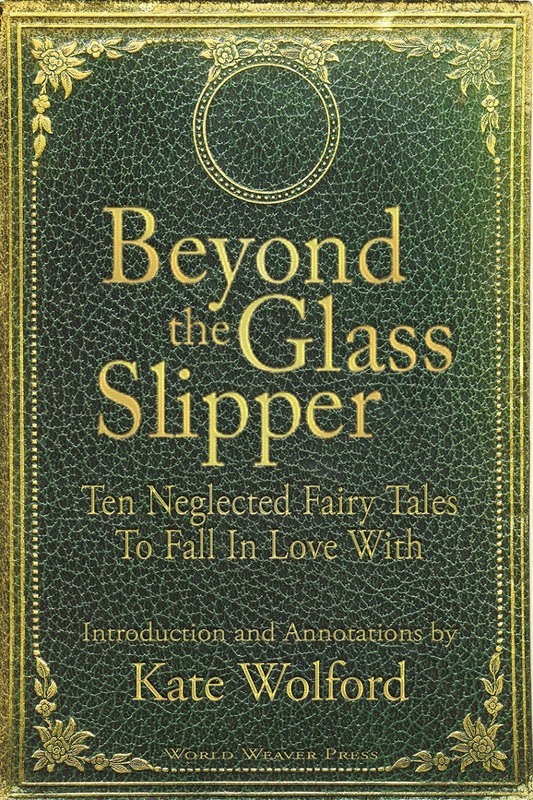 So imagine my surprise when I started reading BEYOND THE GLASS SLIPPER: Ten Neglected Fairy Tales To Fall In Love With, and on the third fairy tale, I got smacked in the face with the familiar story of a woman who can only be won through the accomplishment of an impossible task -- an echo of Brynhild and Sigurd from the Saga of the Volsungs. The prophecy of the princess marrying a man who comes to her in a leaden boat is in keeping with stories about sleeping beauties behind deadly briars, princesses set upon glass mountains, and girls locked away in impenetrable fortresses and towers (p 58). It isn't even that the annotation was telling me something I didn't know. Sleeping Beauty is one of my favorite Disney movies, after all, and I loved Tangled. Disney didn't shy away from using these same tropes. (You could even say it exists in Frozen, for that matter, when Elsa creates her ice-castle.) But something about the phrasing finally tipped me toward the realization that this isn't limited to fairy tales. It's a HUGE part of the Norse Sagas, too. In the Saga of the Volsungs, for example, Sigurd first comes upon (a sleeping) Brynhild in the midst of a battlefield, where he falls in love with her for her wisdom and general awesomeness. They promise to marry one another (though Brynhild warns him it will end badly and they shouldn't exchange any vows) and after they part, she hides herself away behind impossible trials of magic in order to prevent herself from being married to anyone BUT Sigurd. Sigurd is then tricked by his supposed friends into accomplishing these trials, disguised as his brother-in-law (he was tricked into marrying, too), who covets Brynhild, and through this deceit, wins her and gives her over to the other man, who she is then honor bound to marry because she believes he met the impossible circumstances she had sworn to uphold. "Beyond the sea there is a princess of whom it was predicted that she would be married only to a man who should come across the sea in a leaden ship (p 57)." But there's something else these two stories share in common, too -- the man who intends to win the lady can't do it alone. He requires the supernatural aid of his friend. In the case of The Saga of the Volsungs, the supernatural aid comes from Sigurd, in order for Gunnar to win his bride. In The Three Pennies, it comes from a ghost, who is helping a poor Soldier make his fortune, after the soldier rescued his body from grave robbers. So my question is this: Which came first? The Sagas or the Fairy Tales? Or did they share these elements back and forth, back and forth, as the oral traditions became written stories? Or! Could they have each developed this trope independent of one another? The Saga of the Volsungs is dated back to events in the 5th century, though what we have today was not written down until the 13th. We'll probably never know how old The Three Pennies is, or how many generations told and retold it before it was written down and preserved for us today, but as a Danish tale, geographically, it's very likely that this story wasn't told in isolation from the Sagas. And maybe all my consideration is pointless -- maybe both the sagas and the fairy tales pulled this trope from something lost to us which predates them both. But it sure is fascinating to me, to think about. Much like the parallels between Fairy Tales and Greek Myths. Thank you for reading my book, and what a great analysis of the saga!